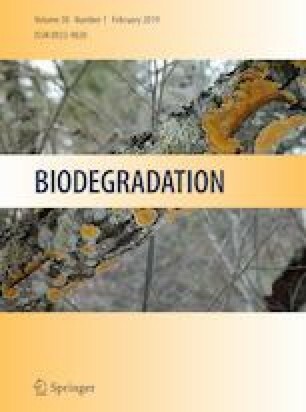 While bioremediation technologies for trichloroethene (TCE), a suspected carcinogen, have been successfully demonstrated in neutral pH aquifers, these technologies are often ineffective for remediating TCE contamination in acidic aquifers (i.e., pH < 5.5). Acidophilic methanotrophs have been detected in several low pH environments, but their presence and potential role in TCE degradation in acidic aquifers is unknown. This study applied a stable isotope probing-based technique to identify active methanotrophs that are capable of degrading TCE in microcosms prepared from two low pH aquifers. 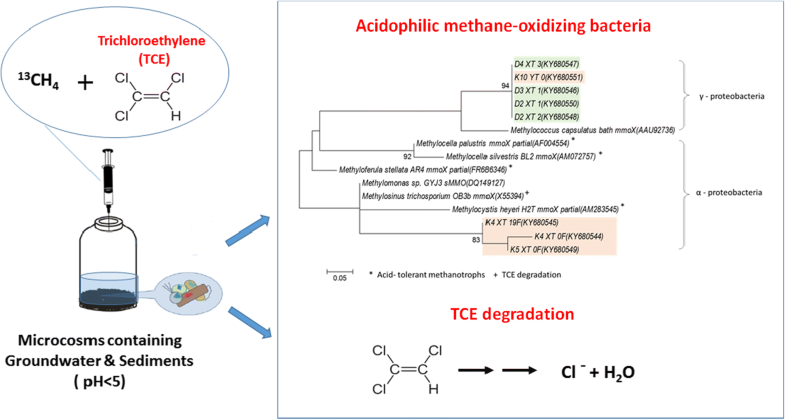 A total of thirty-five clones of methanotrophs were derived from low pH microcosms in which methane and TCE degradation had been observed, with 29 clustered in γ-Proteobacteria and 6 clustered in α-Proteobacteria. None of the clones has a high similarity to known acidophilic methanotrophs from other environments. The presence and diversity of particulate MMO and soluble MMO were also investigated. The pmoA gene was detected predominantly at one site, and the presence of a specific form of mmoX in numerous samples suggested that Methylocella spp. may be common in acidic aquifers. Finally, a methane-grown culture at pH 4 was enriched from an acidic aquifer and its ability to biodegrade various chlorinated ethenes was tested. Interestingly, the mixed culture rapidly degraded TCE and vinyl chloride, but not cis-dichloroethene after growth on methane. The data suggest that aerobic biodegradation of TCE and other chlorinated solvents in low pH groundwater may be facilitated by methanotrophic bacteria, and that there are potentially a wide variety of different strains that inhabit acidic aquifers. The online version of this article ( https://doi.org/10.1007/s10532-019-09875-w) contains supplementary material, which is available to authorized users. The authors thank the Strategic Environmental Research and Development Program (SERDP; Project ER-2531) for supporting some of the studies described herein as well as anonymous reviewers for their helpful suggestions. The results and interpretations presented are solely the opinion of the authors and not of SERDP unless otherwise stated in official documentation.